Directions: To drive safely in Delaware, you need good eyesight and coordination, a sound knowledge and understanding of Delaware’s traffic laws. All applicants for a driver license must pass a written test that covers Ohio motor vehicle regulations and traffic signs. The test contains 20 road rule questions and 10 sign questions.The applicant must correctly answer 80% or 24 questions to pass the test. Do not drink and drive. Warning signs are usually yellow with black markings. They alert you to conditions that are immediately ahead. 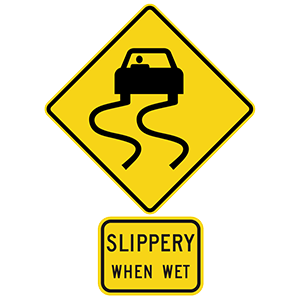 This sign warns that the roadway is slippery when wet. Drive at a speed appropriate for ideal conditions. Apply your brakes as soon as your car starts to skid. When driving too quickly in wet conditions, your tires may lose all contact with the road surface. Loss of traction will cause the vehicle to ride on top of the water, which is called "hydroplaning." The best way to prevent this from happening is to drive more slowly in rainy or wet conditions than you would when driving during ideal weather conditions. Pedestrians walking along the road ahead. Pedestrians must not cross here. Warning signs are usually yellow with black markings. This sign alerts drivers to where pedestrians may be crossing. 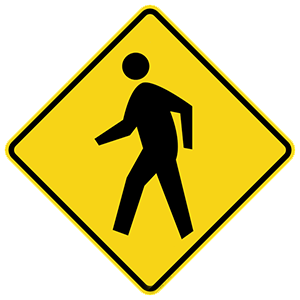 If a pedestrian is crossing in a crosswalk marked with this sign, drivers must stop and remain stopped until the pedestrian is no longer in the crosswalk. Maintain your speed and force the other drivers to create a gap. Slow down on the ramp to wait for a gap. Stop at the end of the ramp to wait for a gap. If you want to enter the freeway but do not see a space for your vehicle in traffic, slow down on the ramp to wait for a gap. Do not drive to the end of the ramp and wait for a gap or you will not have enough room to accelerate to the speed of traffic before entering the roadway. Stop and proceed when you think all of the children have exited the bus. Slow to 25 mph and pass cautiously. Stop for as long as the red lights are flashing. When a stopped school bus is using its flashing red lights, approaching drivers must stop and remain stopped until the lights stop flashing. If the school bus is on the opposite side of a divided highway, drivers do not need to stop. Signal, slow down, and get into the lane closest to the centerline before turning. Signal, slow down, and get into the lane closest to the right curb before turning. Approach the corner in the lane nearest the right curb, but move over toward the middle of the street before turning. Before beginning a right turn, use the appropriate signal to give surrounding drivers adequate notice of your intentions. Slow down and approach the intersection from the right lane, staying as close as is practical to the right curb or edge of the roadway. Bicycles are considered vehicles when used on roadways. Bicyclists and motorists are expected to follow the same rules of the road.